Mario earning 20 Star Points from Jr. Troopa. 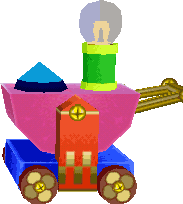 This page lists the amount of Star Points given by each enemy and boss in Paper Mario. When Mario defeats enemies, he is awarded with Star Points depending on his current level compared to the enemies he earns them from; as his level goes up, he earns less Star Points from them. If Mario's level matches or exceeds the enemy's, or reaches the maximum level, 27, he will not earn any Star Points from them at all. 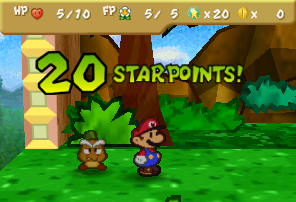 Star Points are calculated by taking the enemy's level, subtracting Mario's current level, then dividing by two. For instance, Jr. Troopa's level during his first encounter with Mario is 41, and Mario's level when fighting him is 1. By subtracting 1 from 41 (40), then diving by 2, Jr. Troopa will drop 20 Star Points when defeated. If the sum has a decimal point, the value is rounded to the nearest whole number. If there are more than two enemies at the start of a battle, a battle multiplier is added for additional Star Points: if there are three enemies at the start, they will all drop 10% more Star Points (1.1). Likewise, if the battle stats with four enemies, they will drop 30% more (1.3). Only the number of enemies at the start of the battle matter for the battle multiplier: any enemies that join the battle after that are irrelevant and are not given a battle multiplier. This page lists the amount of Star Points for each enemy that Mario can earn depending on his level and the number of enemies in a group that enemy is part of, with the battle multiplier added. Bowser only drops Star Points in his second battle against Mario. The Crystal King starts the battle with three Crystal Bits at his side. With the 1.3 x multiplier for having four enemies at the start of the battle, he drops more Star Points than any boss or enemy in the game, more than even Amazy Dayzees and Bowser. How many Star Points the Crystal King drops with the multiplier included is shown on the chart below. After the Shy Squad, General Guy starts his battle with two Stilt Guys, thus the 1.1 x multiplier for having three enemies at the start of the first wave takes effect. How many Star Points he drops with the multiplier included is shown on the chart below. The Goomba King starts the battle with Blue Goomba and Red Goomba, thus the 1.1 x multiplier for having three enemies at the start of the battle takes effect. How many Star Points he drops with the multiplier included is shown on the chart below. 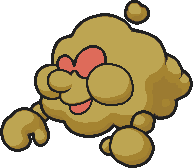 The Gulpits' Rocks that appear in battle with Gulpits count as enemies, so the 1.3 X multiplier for having four enemies at the start of the battle takes effect. How many Star Points a Gulpit drops with the multiplier included is shown on the chart below. After destroying Bowser??? and knocking the Koopa Bros. off their tower formation, the 1.3 x multiplier for having four enemies at the start of their battle takes effect. How many Star Points they drop with the multiplier included is shown on the charts below. The amount of Star Points dropped from Lava Piranha is the same for both phases of the fight. There are some enemies in Paper Mario that do not drop any Star Points at all. 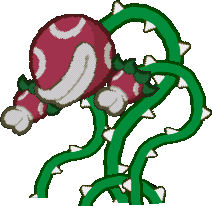 They are often support enemies for bosses (or objects for enemies to use) or are part of scripted battles. The levels of such enemies is 1. Bowser, in his first and final battles. The Koopa Bros., in tower formation. Tubba Blubba, in his invincible form. The Bulb on General Guy's tank. Lava Buds from Lava Piranha. Petit Piranhas from Lava Piranha. Blooper Babies from Super Blooper. Crystal Bits, from the Crystal King. Lee, and any forms he copies. The Master, in all three forms. This page was last edited on July 30, 2018, at 19:40.